All transactions are safe and secure with a reliable history in online purchasing behind each of our associates. 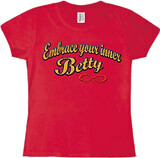 Buy the Embrace Your Inner Betty t-shirt to own Ugly Betty clothing and merchandise. This bestselling Ugly Betty t-shirt puts a twist on the popular phrase, "Embrace your inner beauty." The front of the tee reads, "Embrace your inner Betty." Beneath the phrase on the right is an image of Ugly Betty's red-rimmed glasses, which adds a nice Betty-esque touch to the tee. This piece of officially licensed ABC Ugly Betty merchandise is the perfect gift for female fans of the TV show. In addition to the Embrace Your Inner Betty tee above, browse the Ugly Betty Clothing Gallery for more apparel like men's and women's clothes, kids shirts or hoodies.